I have worked with Jim Williams and his firm Williams, McClure and Parmelee as an Insurance Claims Specialist and found that they do excellent work. The firm knows how to maintain cost consciousness and still achieve outstanding results in defending personal injury and general liability lawsuits. I would not hesitate in the least to highly recommend this firm to any insurance company or third party administrator looking to secure Texas defense counsel for insurance defense litigation matters, commercial lines, personal lines, or otherwise. I would like to enthusiastically endorse Jim Williams for the role of defense attorney, corporate counsel and legal advisor. Jim has provided expert legal guidance and business consulting services for this company for over fifteen years. While he has specific expertise in the areas of transportation, insurance and employment law, he is highly versatile and can handle any business or legal issue quite effectively, including litigation matters. This ability has allowed us to seek his counsel almost exclusively for all legal matters. His strengths include his integrity, his large body of knowledge, the level of research and detail with which he produces an extremely high quality of work, his people and communication skills, and his responsiveness. In addition to being an excellent lawyer, Jim’s has unique business skills which deliver proactive advice to help a business move forward, always looking at all sides of an issue. He has served as a loyal partner to our senior management team. I was very thankfully introduced to Mr. Williams by a client to work on their Texas Workers’ Compensation cases. His work was…fantastic. I knew that I could count on him to be ready, on time, complete, and up to the task. With his help we overcame some significant hurdles successfully. As a Senior Workers’ Compensation Examiner, I unreservedly recommend both he and his firm. Oh, and they handle more than workers’ compensation too. I had the pleasure of working closely with Jim Williams at the same law firm in Dallas before I became a Tarrant County District Judge. He later had cases in my court. Jim is a person of highest integrity and is an effective advocate. He is a first rate lawyer who is committed to working in the best interest of his clients. I would give him a favorable recommendation to anyone seeking to do business with him or to retain him as counsel. Our company has worked with Jim Williams and his firm for nearly 20 years. They do terrific work and are superb at representing businesses defending workplace injury and other personal injury claims, in the insurance defense context and otherwise. They also provide equally skilled representation in defending employment law cases and in handling commercial matters. Jim is honest, thorough, hard-working, and passionately dedicated to getting a great result for his clients. I enthusiastically endorse Jim and his firm as defense lawyers of the highest caliber. James is an outstanding defense lawyer. We have worked together on matters. He is thorough, diligent, hard working and honest. I highly recommend Jim to those looking for a lawyer. I have to compliment Jim on his professionalism and skill in the handling of our workers’ compensation matters. I attended several trials and hearings as an Employer Representative with Jim acting as the insurance company attorney. He is very thorough and communicates well with jurors, judges and hearing officers. I loved working with Jim Williams and have seen him in action at trial in defense of a work related claim against my former employer. He is so thorough and persuasive it seems that he could win even the most difficult of cases. He is great with witnesses, and he is able to cross examine opposing witnesses in a way that is quite entertaining and will inevitably expose the truth. In a case with several hundred thousand dollars at stake, he was able to win a $0 judgment due to his tireless efforts. Justin Malone is not only a bright mind in the legal community, but an excellent communicator. His ability to present his arguments in an impeccable manner in combination with his determined approach has produced countless positive results for his clients. I’ve personally seen him go the extra mile whenever necessary, and would highly recommend him to anyone needing an attorney in the field. Jim is a fierce litigator who I can trust to take care of the clients who come to me looking for an attorney to assist in commercial disputes. I refer all of my client’s with commercial litigation issues to Jim. He is responsive and very appreciative of any clients, big or small, that I send his way. I endorse Jim wholeheartedly. I have worked closely with Jim Williams and his law firm and have seen the dedication and hard work that underlies the outstanding product the firm delivers. The firm has an incredible staff of experienced and knowledgeable employees. I have referred cases to Jim and will continue to do so with complete confidence that his end goal is always client satisfaction. This is a highly skilled Fort Worth litigation firm. They know business litigation, construction law, employment law and insurance law inside and out. It is little wonder that so many companies retain this firm as their go-to litigation law firm in Texas. I refer all of my civil cases to Justin. I am confident in not only his knowledge of the law, but also his ability to skillfully represent clients both in negotiations and in trial. Jim is a man of character and integrity on top of being a truly gifted lawyer. Jim is proficient in all areas of legal matters as well as a caring person that understands relationships are the key to success. I have known Jim for years and had the pleasure of working with him in the past. Jim is an excellent lawyer who is dedicated to his clients and aggressive in pursuing justice for them. I highly recommend and endorse Jim for anyone defending a serious injury or high exposure case in Texas. Our company hired Jim Williams and his law firm to help us with our business formation, incorporation, start up and transactional issues. We continue to use the firm for ongoing legal needs, and are very grateful for the insightful advice and assistance that we have received. When it comes to serving the needs of a business like ours, we would look to no other group of attorneys. This is a superb group of Texas business attorneys, experienced, highly qualified and extremely knowledgeable. It is obvious that the number one goal is client satisfaction. They aim to please. I would easily rate them a 10 out of 10. James Higgins, Owner and CEO, 4X4 Software, Inc.
Jim is an excellent lawyer. I have had the opportunity to work with Jim and have observed his talents in and outside the courtroom. Jim knows how to get bottom line results for his clients. I highly recommend Jim. I had the privilege of working with Jim at a law firm as a young lawyer. After I moved on, I had the opportunity to handle cases for clients who had claims against a client of Jim’s. Jim is a worthy adversary who works to protect his client’s interests while being respectful in the process. Jim also keeps the big picture in mind for his clients, not just concerning himself with the matter at hand but also thinking through the ramifications for other aspects of the client’s affairs. Jim is top notch, grade A.
I have known Jim for over 20 years and can state without reservation that he is both a skilled litigator and a man of great integrity. I’ve watched Jim build his practice by developing long and trusted relationships with his clients, controlling litigation expenses and delivering results. I was introduced to Justin by a mutual contact a few months ago, and we have met a couple of times since on a one on one basis. I have worked with several Employment Attorneys in my time as an HR professional, and I can say without reservation that Justin is a cut above the rest. He is very easy to work with, always responsive, and has a keen ability to take what can be a complicated matter and simplify it for easier understanding. When I have an issue, he is my first call. Some people “joke around” about the credibility and character of lawyers. None of those people have ever met or worked with attorney Jim Williams. When someone experiences a situation that requires legal assistance, it is not a time for “joking around”. When confronted with such a situation, you want and need legal assistance that is knowledgeable, thorough, honest, personable, respectful, courteous, responsive, effective and trustworthy. Attorney Jim Williams is all that and more. As the Safety and Human Resources Manager in the transportation industry at a large company, I met Jim Williams 15 years ago when he was representing our company as our legal advisor and attorney at law. Whether it was a safety issue or a personnel issue, Jim was always readily available to assist us with legal advice and representation in a very effective and personable manner. Jim was always truly concerned for our well-being, and it seemed like he was working for our company, not just providing legal assistance to our company. Jim maintained frequent contact with our company president and myself so we were able to maintain updated status of the situation. Jim was also readily available to assist us when we called him, so we did not have to wait hours or days for a response. Jim is true gentleman and is a devoted family man. Jim is very supportive of law enforcement and those who serve in our military. I now own my own company, Texas Safety Crusaders, and I seek legal assistance and representation from Jim Williams if a situation arises that I need it. I do not make recommendations to anyone unless I am absolutely positive about the quality of my recommendation, and without hesitation I highly recommend Jim Williams. I have 22 years of experience in safety management specializing in behavior-based driver safety education; OSHA certified in Safety, Health, and Environmental Risk Management; OSHA certified in Emergency and Evacuation Planning: owner Texas Safety Crusaders (behavior-based driver safety education for businesses and teen groups) author of a driver safety manual “Driving While Thinking…With An Attitude”; certified Victim Advocate with MADD; Committee Chairman on the MADD North Texas Region Advisory Board; Risk Management Consultant for GALLOP (non-profit providing free, safe rides home from bars for UTA students). 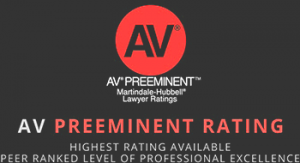 Congrats on the AV preeminent rating! Awesome job! You always were a favorite of mine and now I know why!! You’re just that awesome! What an honor! We certainly appreciate the good work Jim does for our company. Great firm to work with for all your legal needs. Congrats to Jim on the AV Rating. I am not surprised. We are proud to have Jim Williams represent our insurance company. Mr. Williams is always well prepared in Court and zealously represents his clients. I hope Martindale Hubbell will consider him for its highest rating. He is an attorney of impeccable character. Few others know insurance litigation as well as Jim. Absolutely a very fine, competent lawyer. I worked with Jim for a few years. He was extremely competent in the area of insurance defense litigation. Jim is good lawyer, great guy and great to work with. Mr. Williams is a bright and talented lawyer. His Ethical standards are very high. He is highly thought of in this legal community. I worked with Jim for a few years in Dallas. He always had excellent rapport with our clients. Since we both moved on I have referred clients to him. They have all been very happy. In one particular case even though I didn’t see it as a “winnable” case, Jim handled it well and the client was quite pleased. Mr. Williams provides high quality counsel to his insurance defense clients. He has a fine analytical mind and is a good communicator. Working in the claims unit of a large insurance carrier, I’ve had the experience of working with many workers’ compensation attorneys. Jim Williams is easily one of the best. His degree of thoughtfulness, tenacity, and ability to maintain control is something I aspire to achieve. I’ve known Jim for 30 years. I trust him implicitly and he is an excellent attorney. Jim takes the time to find business solutions to legal problems. Mr. Williams has always conducted himself in a very professional manner. I have always known him to be hardworking and diligent, consistently exercising the utmost respect for the law as well his clients, peers, colleagues, and staff. Jim Williams is a highly ethical lawyer who is also an excellent defense litigator. Very intelligent and proactive, he is a very effective litigator in defending companies against claims, particularly in the insurance defense area. Jim Williams is a great lawyer and I highly recommend him for MH’s highest ranking. Jim is a man of character and exceptional knowledge. I would be happy to have him represent me if the need arose. James Williams treats his adversaries with respect while zealously vindicating the rights of his clients. Mr. Williams has vast experience and knowledge in his areas of practice and I have the highest level of professional esteem for him based on the results that he obtains for his clients. I have known James professionally for many years and he is a high quality lawyer. Jim is an outstanding attorney and represents his clients in an ethical and conscientious manner. I have known Mr. Williams for a long period of time and am familiar with both his character and legal abilities. I unhesitatingly recommend him in both areas. James Williams is a hard working lawyer who treats the adversaries of his clients with respect. I have known Jim for 25 years both personally and professionally. Superb lawyer of highest ethical standards. We retained Jim’s services to represent our client in a lawsuit. Yes I would recommend. He is professional, accessible and is extremely knowledgeable. He handled our matter with expertise and confidence. I have known Jim Williams and worked with him on the defense of insurance matters for over 15 years. I have worked with him on both Workers Compensation as well as Liability cases. I would highly recommend Jim. I have found him to be very knowledgeable of the laws and jurisdictions in which he has practiced. Jim is a great partner and willingly collaborates with you on cases in order to achieve resolution excellence.